Explore Edmonton's exciting aviation history from your computer, tablet or smartphone. 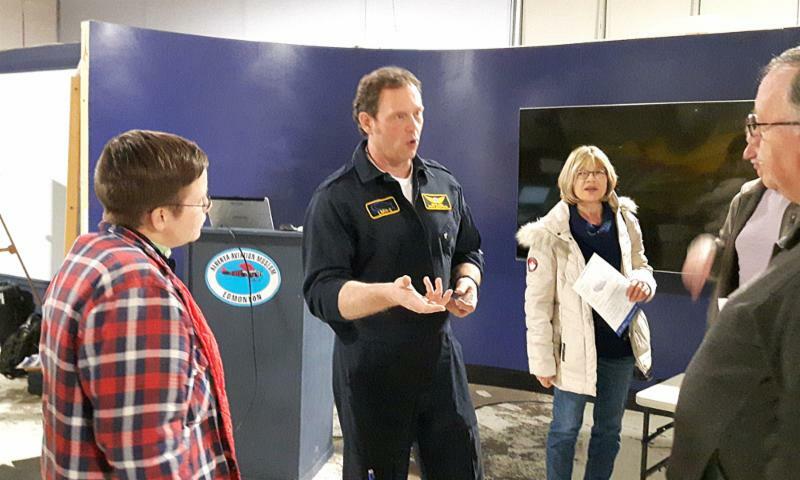 Our revamped Alberta Aviation Museum web site makes it easy! "We are really pleased to be rolling out this new web site," says AAM Executive Director Jean Lauzon. "It's part of an upgrade to the entire museum which includes the revitalization of our exhibits and other improvements to the hangar." "The web site is an important part of that work because it will let us to share our stories online, something the old web site didn't allow." The new site also provides one-stop access to all the museum's social media feeds, including Facebook, Twitter and Instagram, and is formatted for phones, tablets as well as computers. "It's been a lot of work," says Communications Coordinator Steve Finkelman, who led the redesign project. "It's been a real team effort to design and build the site, then write and edit the material." And that work is not over. 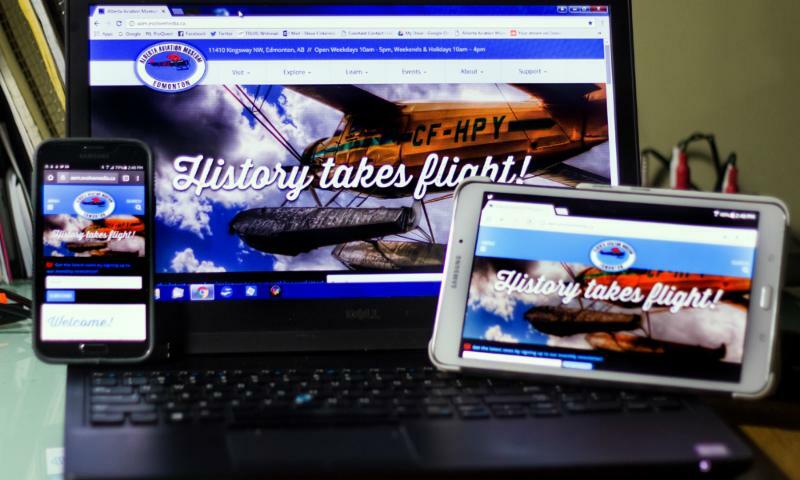 The museum will making regular updates to the site adding more historic photos, stories and videos of our aviation pioneers. "We hope it will be a place that our audience can visit regularly to learn about the pivotal role Blatchford Field played in the development of our city and region," says Finkelman. Special thanks to the staff at Tanner Young Publishing Group, including designer Adam Still and developer Chris Still, for making the web site project a reality. Check out the site and let us know what you think. We welcome comments and suggestions as we build a web site that will let your dreams take flight from any electronic device. 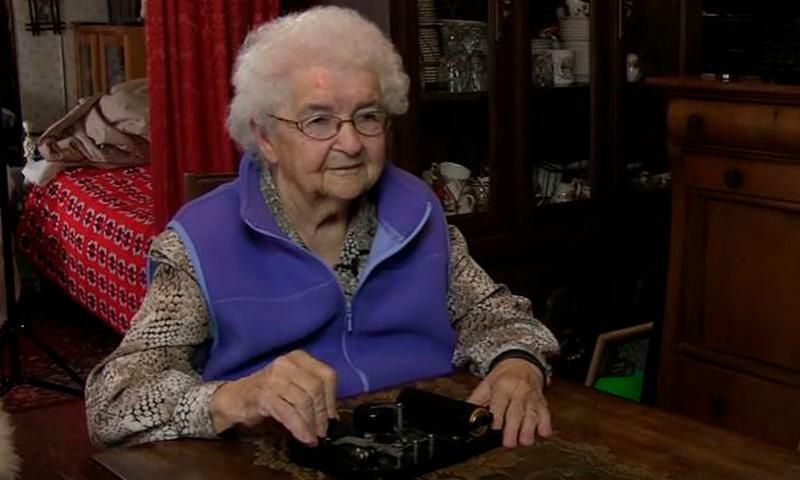 Hazel Fausak, veteran Ferry Command radio operator showing she still remembered some of her Morse Code. Lois Argue, the first member of the RCAF Women's Division to work at Blatchford Field. Hazel Fausak and Lois Argue did not care that aviation was a male-dominated field when they signed up during World War II. So Fausak, from Evansburg, hopped on a train bound for Toronto, where she trained as a radio operator for the Ferry Command. She handled secret communications for military aircraft crossing to Europe. 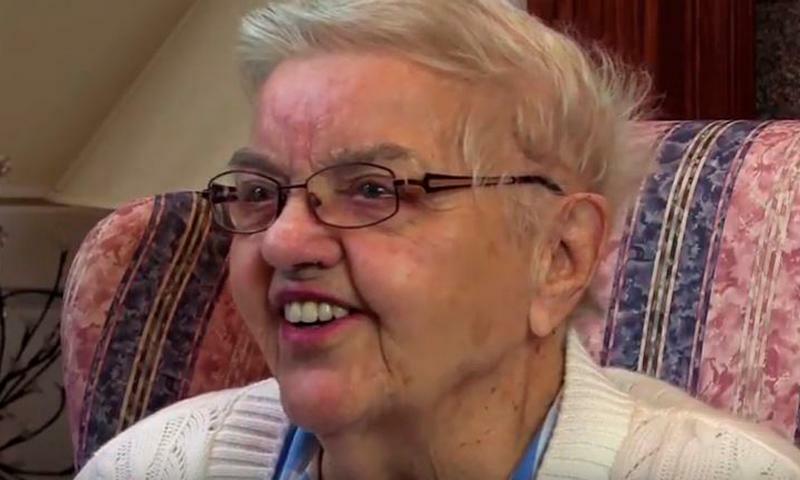 "The only [other] job I could get after high school was as a housekeeper, and that didn't pay very much," Fausak told an interviewer before her death early last year at the age of 93. Argue, now 96, joined the RCAF Women's Division and was the first woman hired to work at Edmonton's Blatchford Field, where she served as a medical assistant. She was similarly unfazed about being the only woman around. "I didn't give a darn," she says.. 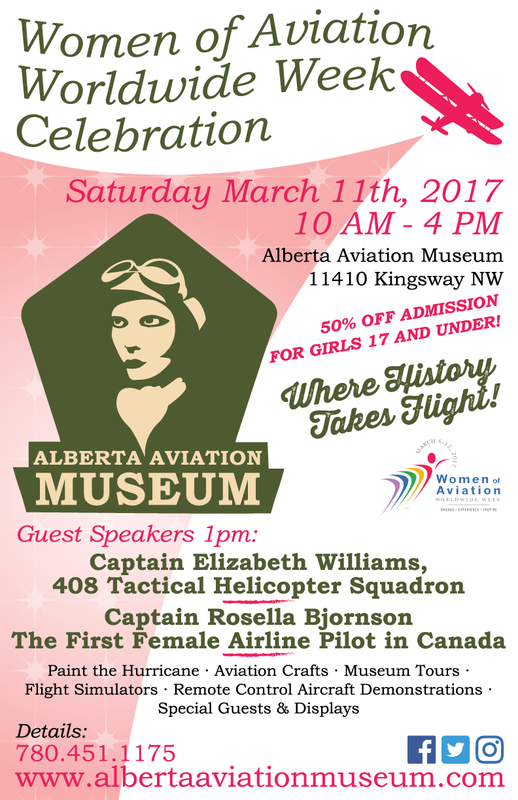 Both women will be honoured during the Women of Aviation Worldwide Week celebration being held at the Alberta Aviation Museum on March 11. "These pioneering women saw a future for themselves in a field that was not welcoming," says Zena Conlin, coordinator of the event. "While things have changed for women in aviation, the numbers are still very small." Women make up only six percent of private pilots in Canada. Fewer than five percent of all airline transport pilot license holders are women.. Female mechanics make up under two percent of mechanics worldwide and women hold only sixteen percent of jobs as air traffic controllers in Canada. "That is why it is important we recognize Women of Aviation Worldwide Week. We need to tell young women there are many great and rewarding careers waiting for them in aviation." Conlin says. Two accomplished present-day pilots will be key-note speakers at the event: Captain Elizabeth Williams, a helicopter pilot with 408 Squadron, based at the Edmonton Garrison, and Captain Rosella Bjornson, Canada's first female airline pilot. There will also be crafts, tours and displays of interest to all ages. Hours are from 10 am to 4 pm, with the main ceremony and speeches at 1 pm. For this event, we are offering half-price admission for girls 17 and under. For more on Hazel Fausak's career check out this Huffington Post story. A biography of Lois Argue can be found here. Short videos of both women can be found at our the museum's new Youtube channel. 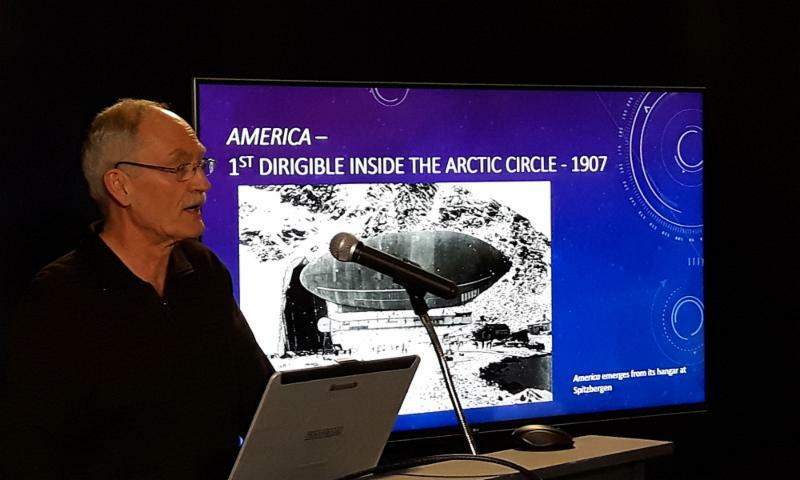 Alberta Aviation Museum historian Neil Taylor speaking at the museum last month as part of the lecture "Back to the Future: Airships Then and Now." Grant Cool, CEO of Hybrid Enterprises LLC, talks with audience members after his presentation about the fascinating future of modern airships. March 11, 10 am – 4 pm. Women of Aviation Worldwide Week. Activities, lectures and displays recognizing the past and current contributions of women in aviation created to engage and inspire the next generation of women aviators.Guest speakers: Captain Elizabeth Williams, a helicopter pilot with 408 Squadron, based at the Edmonton Garrison, and Captain Rosella Bjornson, Canada's first female airline pilot. More details here. April 1, 6:30 pm. Royal Canadian Air Force Anniversary Mess Dinner. Hosted by 418 (City of Edmonton) Squadron. Chateau Louis Conference Centre. Tickets $85. More information here. April 19, 7 pm - 9 pm. Family Movie Night featuring Billy Bishop Goes to War. Part of National Canadian Film Day, the world’s largest film festival...ever! Pay what you can. Details here. April 20, 7 pm - 9 pm. Lecture: Birth of the RCAF. The AAM lecture series continues with Rod MacLeod, professor emeritus, University of Alberta talking about how our air force came to be. Members $8, non-members $10. More details here. April 23, 2 pm. Alberta Aviation Museum Annual General Meeting. Full notice here.